Talbot House is a Belgian town house located in the town of Poperinghe in rural Flanders. Here in December 1915 two army chaplains, Rev. P.S.B. ‘Tubby’ Clayton and Rev. Neville Talbot, opened the house in memory of Neville’s brother, Lieutenant Gilbert Talbot, who had been killed at Hooge in July 1915. The idea was to create a place soldiers could come to, to escape the war. There was a quiet room, a library, a theatre, a place to get tea and in the loft a chapel where men could attend religious services. During the war thousands of British troops knew Talbot House, but in 1919 its former owner claimed it back until the house was acquired for the Talbot House Association in the 1920s. Talbot House was where the Toc H movement was started: Toc H is army signalling phonetic for the initials T.H. = Talbot House. 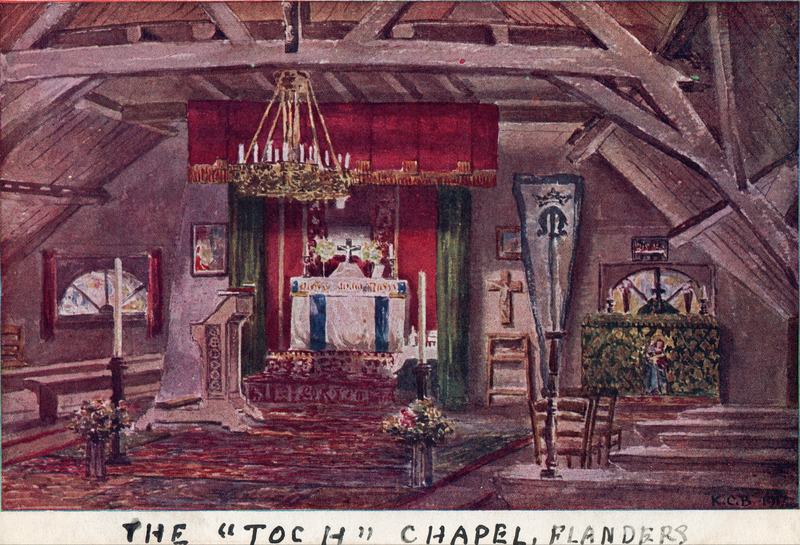 This image comes from a postcard soldiers could buy at the house during the war to help raise money for the house so that everything could be free for ordinary soldiers. It shows the ‘upper room’ where the services took place. A century after Talbot House first opened this view, and this chapel, is almost unchanged. It is one of the places on the Western Front where you can reach out and almost touch the Great War.